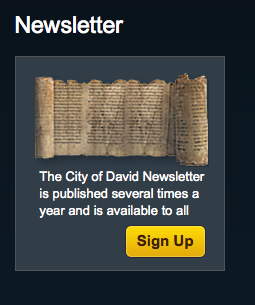 The City of David Newsletter is Hand Written on Parchment and Distributed to All by Holy Doves! 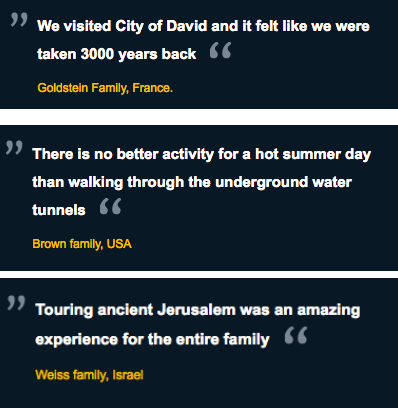 Not only does the City of David offer amazing tours, help visitors cool off in summer, and function as a time machine, it also generates a striking amount of testimonial unity for generically named Jewish families around the world! The fact that you learn almost nothing about the City of David from the City of David’s website is not accidental. If you were to stumble upon their website in, say, The Lonely Planet or the Israel Ministry of Tourism, you would have no idea why in the world a nice 24 year-old Jewish boy named Moriel Zachariah Rothman would possibly write an article beseeching and urging You, as someone who believes in the values of equality and peace, and is thus uncomfortable with ethnic dispossession, never to visit the “City of David” [Again- Moriel himself was there with his Birthright trip. He is no longer granted access to the City of David’s time machine (mentioned above by The Entire Goldstein Family) because of his views, and thus cannot change the past, so in writing this piece, as with every piece he writes, his hope is only to change the future]. Maybe you have heard of the “controversy” around the City of David. If you read to the very end of the 15-section Wikipedia page, and arrive at the three sentence-long “controversy” section, you will learn that ”The right to control both the archaeological and the residential aspects of the City of David is hotly contested by Israelis and Palestinians.” Oh, those Israelis and Palestinians, always hotly contesting everything! (Which is to say: Wow, Wikipedia. Which is to say, please see: The Guardian, 18 August, 2010). If you’ve browsed the internet a bit harder, maybe you’ve even come upon some of the serious and important sources that seek to explain the “controversy” (like this and this and this and this and this (I’ll get back to all of these briefly)). The information is out there, if you know to look for it. What is missing, though, are ethically-grounded, simple-but-not-simplified, action-oriented polemics. And that is why I have compiled the aforepromised list. Can I convince you in 10 items (or less) not to visit the City of David [again]? Let’s see. 1. “The City of David” is located in Occupied Palestinian Territory. While the City of David’s website may lead to you believe that the City of David is located in, well, the City of David, in the reality of 2014, the City of David is located in middle of the Wadi Hilweh neighborhood of the East Jerusalem village of Silwan. According to international law, to the foreign policies of virtually every country in the world, and to general reasonableness, Israel’s post-1967 occupation of the Palestinian territories, including the West Bank and East Jerusalem, is illegal and unjust. A pleasure-oriented visit to occupied territories is a de facto stamp of approval, whether it is made in an armored vehicle or on a goofy-looking Segway. 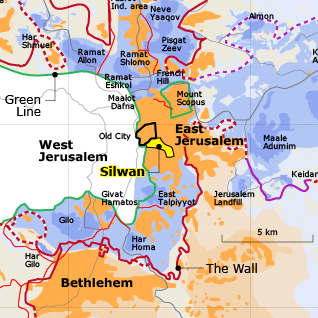 Silwan, highlighted in yellow, across the Green Line. While this post is not dedicated to convincing someone who thinks that the Occupation is legal and just to change their mind, I would fully encourage those folks to read points 2-9 as well, as a specific case study of what your stance means on the ground. ‘”Our aim is Judaize East Jerusalem,’ declared Yigal Kaufman, a spokesman for Elad.” (Joel Greenberg for The New York Times, June 9, 1998). In the framework of the aforementioned agreement, while entrance fees to the City of David do belong to the INPA, the INPA has agreed to pay Elad an undisclosed, “mutually agreed upon” amount of money each year for its management of the park. If this amount exceeds the ticket-sales income, Elad will “fund the deficit via independent sources.” (Articles 9-11, Contract between Elad and INPA, 21 March, 2012 (Hebrew)). If the ticket sales are higher than Elad’s amount (and it is impossible to know from the contract if such a thing is possible, as the amount is not specified), then the “change” will be designated for “investment in the tourist site” of the City of David. All of which is to say: ticket sales are intrinsically linked to Elad’s pocket, albeit in a roundabout way. Why would the INPA, a government body, grant such conditions to an ideologically-oriented, private NGO? 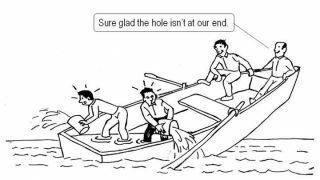 Simple: the two groups share an ideology. Whether in the case of the INPA promoting expansionist land grabs elsewhere in East Jerusalem, or in the case of the INPA overseeing the demolition of a community center and play place right in Wadi Hilweh, Silwan (see item 6 for more details), it seems that the INPA and Elad see eye to eye when it comes to their preferred place for Palestinians in Jerusalem (ie., out of Jerusalem). Enter the City of David. 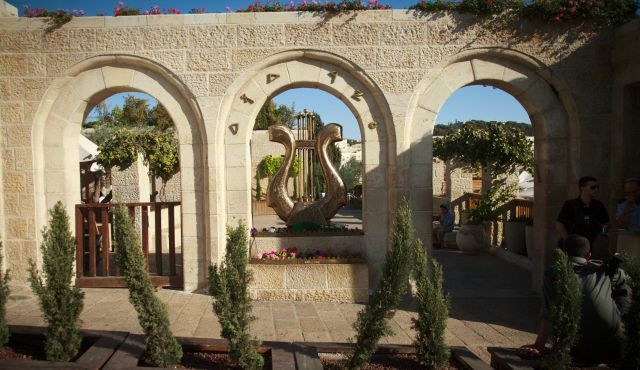 Hear harps playing “Mizmor L’David” (Psalm to David). After you understand what you are seeing, it is a chilling experience. 3. The City of David’s manager’s “Judaization” is not just rhetoric. Elad doesn’t just speak of “Judaization.” Elad Judaizes. For more than two decades, Elad has been working to evict Palestinian families from their homes by taking advantage of an Israeli legal system which discriminates between Palestinians and Jews. Specifically, in the case of Silwan, one of the most prominent features of that legal system- and a feature commonly utilized by Elad- is the “Absentee Property Law.“ (For more on this law and its unique properties, please see this piece I wrote in 2012). The essence of the issue is that this law, like others in Israeli-occupied East Jerusalem, is applied exclusively against Palestinians. Elad, whose organizational aims include ”Judaizing” East Jerusalem, has found in such laws the exact ethnic advantage necessary to being the process of taking over the neighbourhood of Silwan. And the fact that the Israeli State, which claims to be a democracy, can allow such laws to remain on the books, and can continue to support an organization whose aggressive, ethnocentric agenda is explicit is in part because of the lack of public outcry. After all, who is going to cry out against Segway tours and archeological digs? As I stated before, there is a wealth of information about the specific processes, legal systems, histories and politics of Elad, the City of David, Silwan, housing evictions and more. My aim is not to summarize all of it in this post, but rather to pique your interest and outrage, and encourage you to read more. Meron Rapoport and Ir Amim’s “Shady Dealings in Silwan” is a must, as is the Wadi Hilweh Alternative Information Center’s website and resources. For a case-study of a recent attempt at Judaization via eviction in Wadi Hilweh, see the re-cap I wrote of a 2011 campaign to stop the eviction of the Sumarin family from their house next door to the City of David. It is worth noting that this campaign was largely successful (the family is still in their house). It is worth noting this because it shows that it is always possible to do something in the face of injustice. 4. City of David tours give the impression that archeology is the main issue. It is not. Archeology is a front. The main issue is ethno-national conflict. Archeology serves not only to obscure that fact: it serves to enlist support from many who would likely not otherwise support settlement growth and expansion. Like Tel Aviv University. Elie Weisel. NBC (Until they were called out by activists, organizations and the PLO’s Hanan Ashrwai– and then backed out. Another example as to why public pressure and media campaigns matter immensely). And other liberals. And students of history. And You? My view is that Israeli State-led archeology should not be carried out in occupied territory at all until there is a political agreement. Not everyone would agree with me there. That’s OK: even if one is to argue that archeology should transcend politics (although I’d push that “politically neutral archeology” is an oxymoron. As is “politically neutral.” But that may be a discussion for another post), there is still plenty of room for scathing critique of the City of David’s archeological practices, all the way from destroying non-Israelite antiquities to destroying non-Israelite-houses and mosques and roads. For more on this (and more), check out the Israeli Alternative Archeological organization, Emek Shaveh. 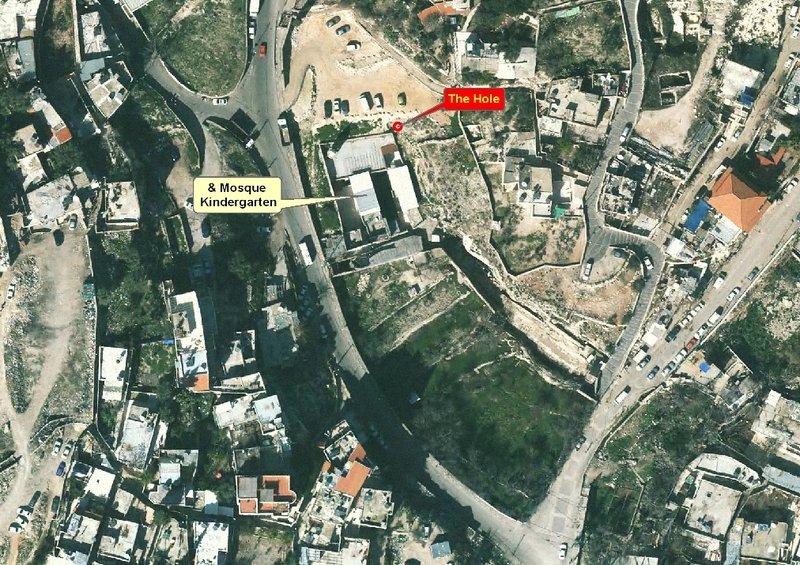 Map by Peace Now’s Hagit Ofran showing the site of one such collapse, near a mosque and kindergarten. 5. The City of David’s newest project, the Kedem Center, will alter Jerusalem and further marginalize Palestinians. 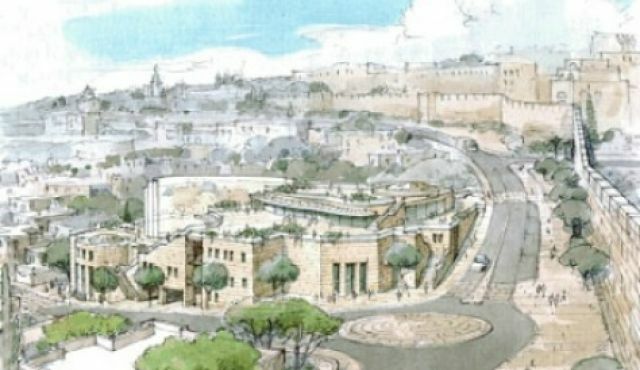 The planned “Kedem Center” will be a sleek, modern, 20,000 square-foot seven-story gargantuan lump (reaching up to the walls of the Old City) in the middle of Silwan. But! If you were worried that this enormous compound may enormously compound feelings of exclusion, takeover, separation, let your fears be allayed: according to its designers, the Kedem center will be a “cultural and gathering center.” That sounds nice. Oh, right, and it will enable visitors to walk from the Western Wall all the way down to the end of the “City of David’s” adventureland, all without having to see a single Palestinian house. Or maybe even a single Palestinian person. The Soft ‘n Fuzzy Illustration of the plan by the Ministry of the Interior. 6. To “make way” for the City of David, Palestinian property is destroyed. In 2012, the Nature and Parks Authority carried out a demolition of a community center and play place in Wadi Hilweh, in conjunction with plans for the Kedem Center. This center, which was built by activists at the Wadi Hilweh Information Center (mentioned in Item 3), served as the only public space and playground for the children of Wadi Hilweh, who otherwise have to play on narrow streets filled with cars, Jewish settlers (supported by Elad) and State-funded private security guards. (For more on this subject see ACRI’s petition to the high court, in which they note that ”[in 1991] ELAD called upon the services of the security firm Modi’in Ezrachi, and to this day the same company provides all such security services in East Jerusalem. The State at the time, however expressed its opposition to the protection of settlers by private security companies.” Initial opposition notwithstanding, the State then began funding the Modi’in Ezrachi guards itself). Activists from Wadi Hilweh and the Palestinian hip hop group DAM have recently launched a powerful, chilling project about child arrests in Silwan called Room No. 4, which includes photographs, video and writen testimonies, analyses from lawyers and social workers and more. This project is also a must for anyone interested in learning more about the impact of child arrests on children and on an entire society. 8. 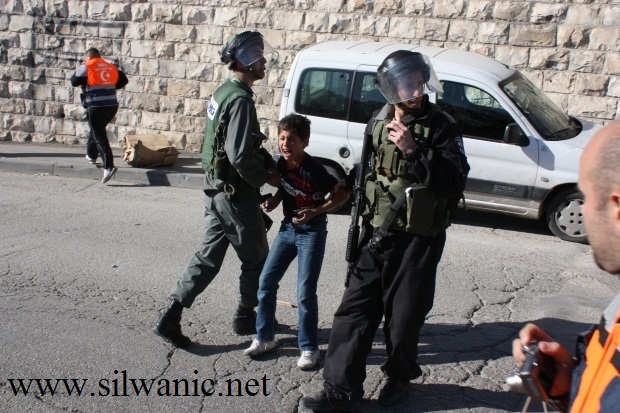 The City of David violates human rights in the name of the Jewish People. Palestinian families are being evicted from the homes their parents built, Palestinian children are being arrested, streets and houses in Silwan are collapsing, structures that did not collapse are being demolished to make way for a massive, glitzy visitors center: And all of this is being done in the name of the Jewish People and Jewish History. To me, though, the important parts of Jewish peoplehood and Jewish history are neither artifacts nor tribalism. The important parts of Jewish peoplehood and history, to me and to many others I know, are those that lead us to seek and speak out for justice even when it is unpopular to do so: even when that means speaking out against the very institutions that claim to represent us. It is time to learn Yiddish. 9. The City of David endangers the future of Israel. The argument of Jewish values and human rights may not be compelling to some readers. Kopasetic. Let’s go at it from a different angle: The City of David is dangerous for the future of Israel. Here’s how: Israel’s future is inextricably linked with the future of the Palestinian people. This has been the case from the get-go, no matter how hard some may have wished it wasn’t so, or how actively so many Israeli leaders tried to ignore and deny it. This need not be a point of despair: This need not be a zero-sum game. Rhetoric of Judaization, though. Placing emphasis on Jewish history not as part of but as the only relevant part of Jerusalem’s history, though. Evictions, demolitions, aggression and abuse, though. All of these things serve to turn the situation into a zero-sum game, not to mention the ways in which they undermine Israel’s chance at actually becoming a liberal and pluralistic democracy. Zero-sum games are dangerous and false: in real life, outside of the castles of political science and political power, there is no such thing as a winner. There is only cruelty, violence, paranoia, anger, fear and suffering. [Update: February 13th, 2014. 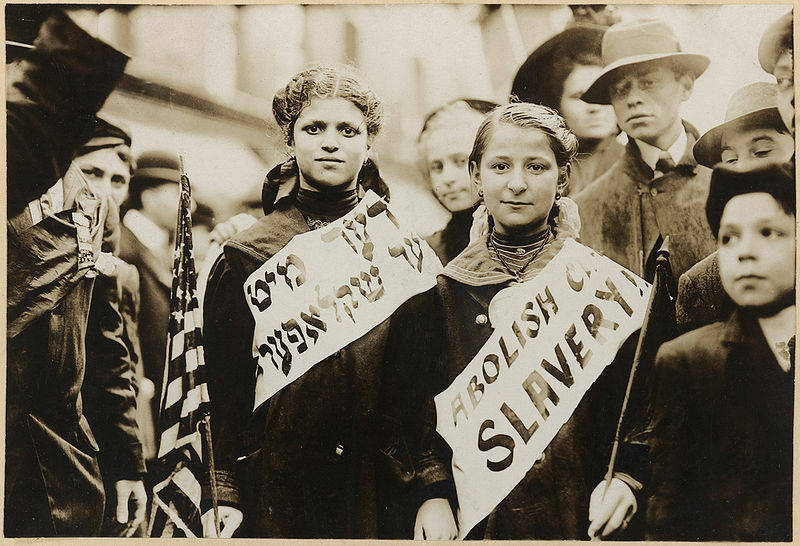 For a devastating and crucial perspective on the heinousness of the zero-sum game ideology, see Eva Illouz’s essay in Haaretz comparing the occupation to American Slavery]. 10. There are ways to learn about the history, politics and archeology of Jerusalem that do not come at the expense of Palestinians residents and endanger Israel’s future. I assume, if you made it here, to point 10, that at least some of the aforementioned points spoke to you, on some level. But perhaps you still want to learn more about the history and archeology that the City of David touts? Or maybe you just want to hear more about life in Silwan? Or maybe you are almost convinced, but want to see everything for yourself? Good. It just so happens that there are a number of excellent organizations and individuals who will be willing to help with all of the above. Emek Shaveh, the Israeli Alternative Archeology organization, offers guided tours of the non-ticketed sections of the City of David and parts of Silwan. The Wadi Hilweh Information Center is committed to sharing an alternative narrative with groups willing to listen. You can be in contact with either of these organizations directly. Or, if that sounds too complicated, or scary, or effort-filled, contact me and I will put you in touch with the right people and/or take you there myself. Just say the word. Elad is incredibly well-funded (according to a 2011 Haaretz article, Elad is the wealthiest right wing NGO, and had an operating budget in 2008 greater than that of the top seven left wing NGOs. Combined). They have the support of the government, Jewish institutions and cultural figures. They have extensive international connections and networks, a charming website, an innocuous brand of Archeology and Segway Tours. And what do we have? Our voices. Fairness. Anti-cruelty. Hope for better days to come. If any or all of the ten reasons above were compelling, surprising, convincing or new, spread them around. The issue at stake is much more extreme than artifacts and harp-music. The issue at stake is the future of this place. Abaye, great question. To a certain extent, yes, and I think it is important to acknowledge that fact. However, I think the Old City, and particularly the Holy Basin, needs to be treated as a case unto itself because of its religious and historical significance to both/many peoples. The Old City itself even breaks down into different categories– for example, I see the Jewish Quarter differently than Jewish settlements within the Muslim Quarter. “Territory” is just the beginning of the question of occupation– which is where points 2-10 become important. What a joke. I read the entire thing too. USA needs to give land back to the native Americans, and the rest back to England if all this is the case as we occupied territory. Also, Israel and all the other countries formed after WWII need to go back to their original countries because we cannot deem it and to the original countries we acted illegally taking their land. And for this last reply, “…the Holy Basin, needs to be treated as a case unto itself because of its religious and historical significance to both/many peoples. The Old City itself even breaks down into different categories – for example, I see the Jewish Quarter differently than Jewish settlements within the Muslim Quarter.” <- Who made all those quarters up? Some person, and it was taken back and forth throughout history between many people. You also just failed your argument for valid fact when you threw in a "I see" for you opinion, since this is all based off peoples opinions, the land after WWII was based off peoples opinions. Ironically, I believe the world will do what God wills it to do, and don't pay a lot of attention to this stuff. This is a joke though. If they found the City of David, which has "…religious and historical significance…" not to both (palestinians aren't worried about the Judaic City of David that shows claim to the area from long ago, they'd rather not see it, and obviously you feel the same) but to the Jews, then they should. Also, you're hopes for Israel to be a liberal democracy is just you trying to force your own ideas. Liberal isn't the only happy way in life, and it's not the only right, non-racists, fair, and tolerant way either. They won the land in war, welcome to EVERY SINGLE OTHER NATION in the world, whether it be by fighting or a gift. Like I said… what a Joke. Correction on USA — give land back to Spain, France, force Mexico to give it’s land back because we can’t give Texas and surrounding areas to them because Spain owned it first, and all the rest of the claims originally there outside of war go back to their original owners/nations. But WAIT! That wouldn’t work either, because I doubt anyone knows exactly where every single person was from the beginning of time, so we’re all screwed. I don’t support war, but it happens, and the world and nations, like the United States, became of war. Denounce that and you don’t understand. Acknowledge it, and you’ve proven yourself wrong on Israel. ^ Unless you hate America too, then you really don’t care about anything except your way (it seems that way from the article anyways, your way is the right way, period). I love the triple posts I just keep getting so humored on this insane topic. Thanks Moriel, very refreshing to read the ‘inside scoop’ from one who was once on the ‘inside’…All the best to you, and I encourage you to continue in your efforts to ‘change the future.’ Peace Shalom Salaam to you. I think Be Realistic accurately expresses the opinions of most Americans. We are children of war and bringers of war and so only war and spoils make any sense to us. Conservative religious Americans go one step further denying science, history and social justice in the name of “God’s will.” Politically conservative American idealists would call their own jihad on Muslims and usher in some kind of Jerusalem Disney full of happy Jews dancing to Hava Nagila and wearing clean linen robes so we can take photos. Liberal Americans almost court anti-Semitism in their race to damn the Israeli government for the settlement movement. Be Realistic sounds about average to me, an American. I didn’t visit the city of David because my family that lives in Israel just said, no, it is not appropriate if you love peace. And that was good enough for me. This is nonsense!!! The site only goes to prove the “palestinian” lie that the land belonged and belongs to them!!! The entire “conflict” also only proves the total intolerance of the muslims of ANY other religion or historical truths other then there own lies that they want everyone to believe. That “green line” you refer to has absolutely no “international law or legal” purpose at all. From the time of the Palestine Mandate the arabs were offered ALL of what is today “jordan” as a “home land” for the invented people that have never been a nation and they REFUSED!!!! While I have no issue with the muslims or arab peoples and have many friends who are both, I do not buy into their lie about “palestine”. I also do not blame them as they are simply continuing the lies told to them from their fathers and grandparents…..but continuing that lie does not somehow make it reality!!! I have been to Ir David many times and look forward to returning again this trip when I am back in Israel. I am so sick of people like you who only feed the lies of Muslim Arabs who call themselves Palestinians, encourage antisemitism and worse, terrorist attacks and the consequent murder of people. Shame on you. And you’re Jewish! What is wrong with you! And someone above is right. ‘Palestinian’ land huh!Where is their people’s artifacts and ruins. There aren’t any, because they never existed. How hard is that to understand. By the way the root of the word Palestinian means invader. And do I really need to go into the details of where the term Palestinian comes from. Do you only read the crap that feeds your self righteous and dangerous narrative. Thanks! For me these are all points to actually visit this place. Those leftist, gutmenschn liberal people, same as communists and fashists! !